Seismic activity is elevated. This event comes after a period of gradually increased strombolian activity at the craters in recent weeks, with increasingly high levels of the magma column. Residents from the islands reported frequent detonation waves that rattle doors and windows. The eruption lasted about 3 minutes and showered the crater area with incandescent material, probably also reaching the public viewing area at Pizzo. There are no reports of injuries as presumably nobody was in the summit area at that time. What is causing these so-far isolated strong explosions - in a period of generally only low to moderate activity otherwise - is unclear, but they should serve as a warning to everyone climbing the volcano these days: they are not predictable and chances are that other ones occur in the near future with no warning. Bombs were landing on a vast area around the crater terrace including the viewing area on Pizzo, but fortunately, it seems that no people were there at the time of the eruption. 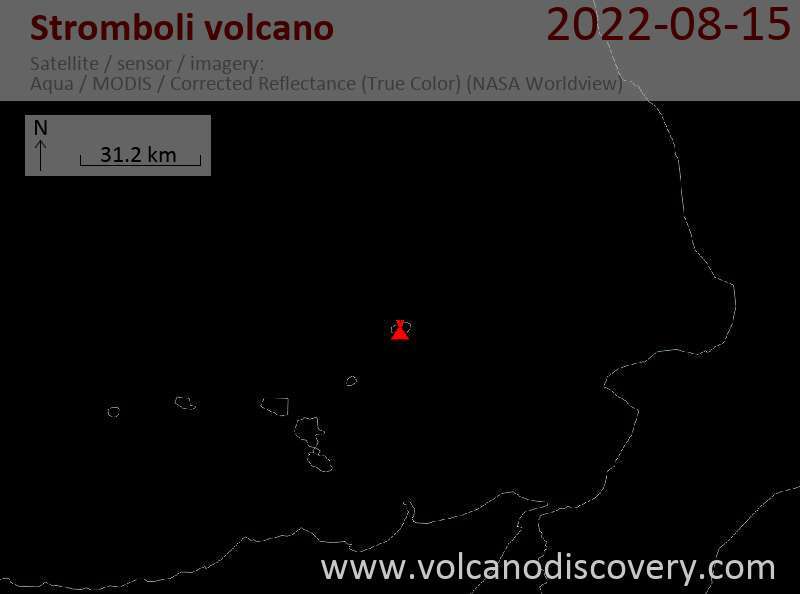 It appears that there were no significant precursors to the event which illustrates that even during periods of relatively low activity, Stromboli volcano can be dangerous. There are no reports of damage or injuries. We observed 4 active vents: the westernmost vent with sporadic (30-40 mins interval) mild eruptions rich in ash and only few incandescent bombs, the central vent with constant glow showing pulsating degassing (but no visible spattering), and the two large vents of the eastern crater. During 16 June, 6 vents in total were found active (s. attached image and crater map of earlier update): two in the western crater area (left in picture, S1, S2), two adjacent vents (C) in the central (southern) part and the large cone-shaped vents (right in picture, N1, N2 with eruption) that compose the eastern crater. When observed last night, powerful strombolian explosions from this vent, often accompanied by loud detonations, often reached or even exceeded 200 m height, and occurred at intervals of 5-10 minutes. Many explosions were of moderately large size and ejected lava bombs higher than the observers' position on Pizzo, i.e. more than 200 m above the vents.